Wilton residents vote to pull the town's support of the New England Clean Energy Connect on March 5. FARMINGTON - Beginning on April 1, five days of public hearings will be held on the University of Maine at Farmington campus regarding the New England Clean Energy Connect project: a 145-mile long Direct Current transmission line stretching from the Canadian border to a new converter station in Lewiston. The Maine Department of Environmental Protection and Land Use Planning Commission will be receiving testimony from the public, marking the latest opportunity to be heard on a $1 billion project that has raised strong emotions in western Maine. Following the passage of An Act Relative to Energy Diversity in 2016, Massachusetts issued a request for proposals to provide 9.45 terawatt hours of clean energy. Forty-six bids were submitted; NECEC was Massachusetts' alternative if the Northern Pass Transmission project failed to acquire approval in New Hampshire by late March. That did occur, and CMP now has contracts with Massachusetts and Hydro-Québec to deliver the project by December 2022. The $950 million project consists of 189 total miles of either new corridor or improvements to infrastructure, with 72 percent of the project making use of existing transmission corridors. A total of 145 miles of the project would link a substation in Lewiston to the Canadian border through a direct current transmission line with 1,200 megawatt capacity. Roughly 73 percent of that would follow preexisting transmission lines. The remaining 44 miles of the project would impact alternating current infrastructure south of Lewiston and from Winslow down to Wiscasset. The project would enter northern Franklin County in Beattie Township, passing through Lowelltown and Skinner Township before crossing into Somerset County to the east. This section would be roughly 12 miles of new corridor, with that corridor maintained at 150 feet in width around the line after construction. The NECEC reenters Franklin County in Industry at the Starks town line, traveling for 20.6 miles through six municipalities: Industry, New Sharon, Farmington, Wilton, Chesterville and Jay. In Franklin County, the initial public reaction was largely positive. A number of towns and the county commissioners voted to support the project, citing projections of increased property tax revenue, job creation during construction and lower electricity costs in Maine, as the state is part of ISO New England, the regional transmission authority for the New England states. Locally, concerns began circulating in mid-2018, largely stemming from reviews of NECEC and other, rejected bids submitted in response to the Massachusetts RFP. Former Sen. Tom Saviello of Wilton approached local boards, requesting they reconsider previously-issued letters of support on the basis that he said NECEC's impact had exceeded the benefits. An informational meeting held at the Mt. Blue Campus on July 16 drew more than 100 people. One of the most frequently asked questions revolved around the project's lack of financial incentives, specifically referencing proposed projects in New Hampshire and Vermont. At that point, CMP had put forward a roughly $22 million package of investments and land transfers to benefit the Kennebec River Gorge--a region that NECEC will cross through--but no further statewide incentives. Instead, President Doug Herling argued that CMP had spent years designing the project's path with the goal of minimizing the impact on the state, and therefore a substantial funding package had not been incorporated into the project. Since that meeting, support and resistance to the project has divided communities and organizations. 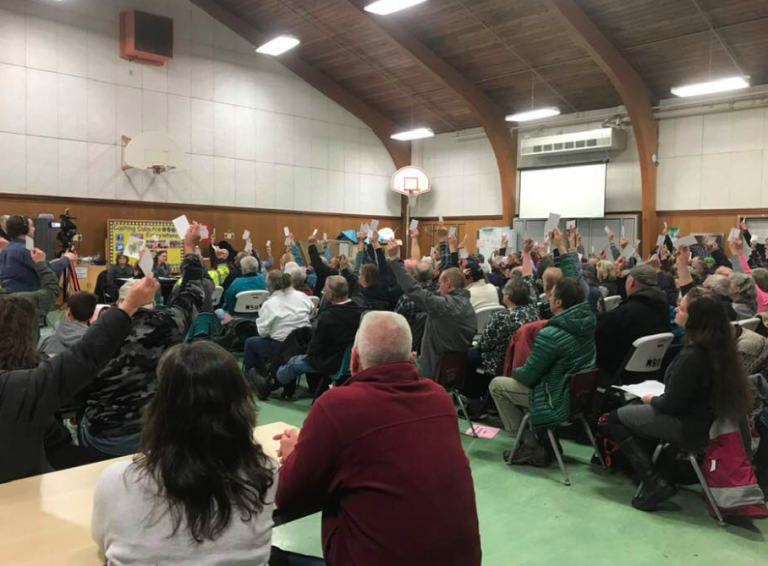 More than a 100 Wilton residents recently voted to instruct that town's selectboard members rescind support and oppose NECEC, for example, while the Jay Board of Selectpersons voted to continue supporting the project in November 2018. Farmington residents will vote on the town's NECEC stance at the annual town meeting on March 25. Negotiations between CMP, the Governor's Energy Office, the Office of the Public Advocate and other stakeholders, including the Industrial Energy Consumers Group, the Conservation Law Foundation and the Acadia Center, yielded a settlement that concluded that NECEC would not be funded by Maine electricity customers. That settlement included $258 million in incentives, ranging from $140 million to lower electric rates and $50 million support low-income customers, over 40 years; funds for heat pump installations, electric vehicle charging stations and high-speed internet service. In Franklin County, $5 million would go toward supporting economic development, $4 million would go toward vocational programs and STEM-related programs in Franklin and Somerset counties, and $1 million would be earmarked for internships and UMF scholarships. Gov. Janet Mills authorized the Governor's Energy Office to sign onto the settlement. In a radio address released on March 1, Mills cited provisions of the settlement, but also NECEC's impact on reducing greenhouse gas emissions. One of the biggest points of contention between project supporters and those opposed to NECEC is that impact. CMP and organizations in support of the project quote an estimate by London Economics--the firm hired by the MPUC to evaluate the project--that NECEC would reduce carbon dioxide emissions in New England by 3.6 million metric tons annually. Opponents disagree with that assessment, accusing project supporters of "green washing," a term that refers in this context to the purchase of electricity generated via conventional means which is then presented as green energy. CMP's claims of carbon dioxide emission reductions are based off the energy needs of New England and preexisting sources of electricity that are scheduled to be retired, including the Pilgrim Nuclear Power Station in Plymouth, Mass., and the coal-fired Brayton Point Station in Somerset, Mass. Those and other retirements will force New England to generate electricity through alternative sources, CMP director of communications John Carroll said. While wind and solar options should continue to be developed, Carroll argued, they couldn't produce consistent "base load" power like nuclear, hydro and natural gas. Providing roughly 10,000 gigawatt hours annually, NECEC would replace some, but not all, of that retiring base load supply, Carroll said. Given a lack of public support for new nuclear plants, the other realistic option to provide the New England grid with a new source of base load power was natural gas, Carroll said, probably provided by the Marcellus Shale field. "If you're turning away from hydroelectric power, you're saying that your base load will provided by gas or oil," Carroll said. Sue Ely, the Natural Resources Council of Maine's staff attorney and Climate and Clean Energy policy advocate, said that depicting Hydro-Québec as the only way that the New England grid could meet its future electricity demands is overly simplifying a complicated issue. The NECEC line would lock New England into 40 years in what Ely characterized as an old, inflexible model: a single line feeding into the grid, rather than generating green energy within New England. There was no contractual guarantee that the project would provide Massachusetts power companies with entirely green energy, above and beyond what was already flowing into the grid, Ely argued. That's an issue that the Massachusetts Attorney General has also raised to that state's Department of Public Utilities, Massachusetts' equivalent of the Maine Public Utilities Commission. Instead of generating the electricity beyond contractual minimums via hydro power, Ely said, Hydro-Québec could purchase electricity generated at a natural gas plant, effectively rerouting hydro-produced power out of another market to New England. "There's just no guarantee that we're getting clean energy from this deal," Ely said. Hydro-Québec director of communications Serge Abergel said that he was bewildered by claims that Hydro-Québec couldn't provide the electricity to empower NECEC. The company's network--mostly hydro, with some wind--was oversized for Quebec's needs thanks to a 20-year build up that occurred alongside a development slowdown in the province. Currently, the company is exporting more than 30 terawatt hours: roughly half to New England, a quarter to New York and the remainder divided between Canadian markets beyond Quebec. The company maintains 63 generating stations and 28 reservoirs, all of which Abergel said are now effectively full, at 98 to 99 percent. At this point, Abergel said, Hydro-Québec was facing a "sell it or spill it" decision every time it rains. "These surpluses have become significant issue," Abergel said. In 2018, he said, Hydro-Québec spilled--that is, released water that bypassed its turbines--enough water to generate more than 10 terawatt hours of electricity. This potential capacity, something that Abergel said would only grow as roughly 300 older turbines were replaced by newer models, made accusations of green washing implausible, the spokesperson said. "It makes absolutely no sense why we would be buying something that we're spilling down the river," Abergel said. Ely questioned the use of spillage figures to buoy Hydro-Québec's arguments; dams spill water for different reasons at different times, she said. Spillage could be concentrated during the months of high rainfall, for example, when the NECEC project calls for steady electricity exports year-round. Assumptions made by those studying the project have included high rainfall totals and a relatively low continuing growth rate in Quebec, Ely said. She noted that Canadian newspapers covered requests made by Hydro-Québec in January to Quebec consumers to reduce appliance and heating use--the majority of Quebec homes rely on electric heat--to prevent the company from purchasing electricity from other power grids. The Maine State Legislature has taken up the emissions issue with Sen. Brownie Carson (D - Harpswell), a former NRCM executive director, submitting LD 640, Resolve: To Require a Study of Greenhouse Gas Emissions Reductions from the Proposed Central Maine Power Company Transmission Corridor. That would order the Maine Department of Environmental Protection to issue a report prior to June 1, 2019 to the Legislature and the Massachusetts Department of Public Utilities regarding the "total net effect of greenhouse gas emissions" throughout New England and beyond. Ely and the NRCM have other issues with NECEC beyond the emissions debate. Grid congestion at the Lewiston station and at the Maine/New Hampshire border concerns opponents. Reducing the amount of available headroom, even with some upgrades in Lewiston and further south, could result in new Maine projects being left without the means to transport their product. Local energy projects represented a better deal for Mainers than a transmission line, Ely said, in terms of infrastructure investment and job creation. She said that Maine could lose future opportunities to leverage in-grid solar, wind or battery improvements in exchange for what she termed as a slug of energy, pumped into a stringy Maine grid for 40 years. Between supporters and opponents, the impact of NECEC on Mainers' electric bills is also up for debate. CMP's projection predicted a $40 million reduction each year over a 20-year period, while London Economics pinned that number at $17 million. The difference in the estimates, Carroll said, related to differences in the models and the estimated cost of natural gas over the next 20 years. In any case, he argued, NECEC would introduce a cheap source of power to the bid stack pricing method used by NE-ISO; megawatts produced via hydro would replace expensively-produced megawatts from natural gas. Opponents have been dismissive of the potential electricity bill reductions, saying they'll represent a few cents on the average rate payer's bill. While lawmakers and policy experts have been debating emissions reductions, grid capacity and consumer savings, the local debate has largely focused on the 53 miles of new corridor, 12 of them in northern Franklin County. Opponents call the land undeveloped, part of one of the largest contiguous temperate forests in North America, and argue that NECEC will negatively impact deer migration, brook trout habitat and other animals, as well as businesses that rely on outdoor tourism. A number of opponents have suggested that CMP should have given more consideration to burying the line, along Route 201 for example. "They chose a route that's best for them," Ely said. CMP argues that it took special care to avoid sensitive areas and that the area that will be impacted is working timberland that is privately-owned. Carroll pointed to comments made by the Maine Forest Products Council, which represents the owners of more than 8 million acres of commercial forestland, to the DEP and LUPC in January. While not taking a position on the project itself, MFPC brought up its members' concerns with public comments regarding the importance of the region to the public. "... [A]ny evaluation of effects on the scenic character of private land from a proposed development should give maximum weight to the landowner’s position if the landowner has no objections to the proposed use. To reach any other conclusion would be to grant public rights on private property. MFPC members do not want regulators to consider views from their land in deciding whether the CMP project will have an adverse effect on the scenic character of the members’ land," MFPC Executive Director Patrick Strauch wrote. A decision by the MPUC on CMP's request for certificate of public convenience and necessity is expected in early April. The DEP will be holding a public hearing on NECEC on April 1 through April 5 at the University of Maine at Farmington campus. Topics of the DEP hearings will include: potential impacts to scenic character and existing uses; potential impacts to wildlife habitat and fisheries; the alternatives analysis; and proposed compensation for impacts and mitigation of impacts. The hearing will include daytime and evening sessions. Daytime sessions will be devoted to receiving evidence from the applicant and parties granted intervenor status. Members of the public may attend, but not participate in, the daytime sessions. The evening sessions will be devoted to receiving testimony from members of the public. On Tuesday, April 2, DEP's hearing will be held jointly with the LUPC, effectively the planning board for the Unorganized Territory. That hearing will focus on the LUPC's review criteria related to potential impacts to scenic character and existing uses and the alternatives analysis. *The Commission will accept testimony from the parties beginning at 10:30 a.m. The DEP and LUPC process will begin around that time with hearings on April 1 through April 5; CMP expects that process to take two-and-a-half months. After that, NECEC would need approval from the Army Corps of Engineers, possibly in September, and then a Presidential Order in December. CMP wants to begin construction in the first quarter of 2020. The project's delivery date is Dec. 13, 2022. Janet Mills /Cmp Leave Maine the way life should be! I vote NO! I wish everyone here the best, in coming to terms with reality; though anyone who has lived elsewhere, knows that Maine is not immune from the growth of the Nation and it's ever demanding lifestyle. Interesting, all the NIMBY's in Maine can start a club with the New Hampshire and Vermont NIMBY's. They also turned this down. One of the benefits of this club will be to be able to visit each other by horse and buggy, and communicate with hand-written communications. Probably have to bring back outhouses and store food with ice. Doesn't appear that New Hampshire and Vermont care about the future either. Lion/Eagle its only a done deal after you give up and roll over, which is exactly what they want you to do. In the 1970's DDT was routinely sprayed on our forests as an exfoliate and it almost killed off the eagles. DDT was an approved herbicide and Industry wanted it and it was approved by the state regulators. Point is things can change, and when enough people become outraged the odds start to tip in our favor. There are several hurdles to project approval: PUC and DEP and LUPRC permits, pending legislation and then legal challenges. Give up if you want, but many people are outraged and galvanized in opposition to this project, Those people are prepared to fight for whats right. Watch what happens in Farmington next week at the town meeting on the 25th- another chink in the armor of the condescending industry hacks out to do real Mainers harm for their own profit. Unfortunately for CMP and their cronies, we are onto them. PUC - most comments ever submitted on a project virtually every comment against the project. Every other poll I've seen at least 80% against the project. These are not typical 55/45 splits. We are winning and the only question is do the powers that be work for the people or for the money? We shall see but in any case, it is not a done deal. All six New England States are committed to shared participation in a network comprising electricity generation and transmission. Rules conducting the competitive marketing and safe, reliable and cost effective interstate delivery of electricity are established by the system operator, ISO-NE. New England states are no longer completely and individually autonomous in producing and consuming electricity within it's own borders. This expansion from State control to regional control has brought with it new challenges, as sometimes, there are still differences among the states. Some differences are physical, as in population and size, some are weather related and some are political. ISO-NE must consider the physical and weather differences, but must remain neutral when political issues arise. The focus for ISO-NE is to make sure generation meets demand and flows smoothly from generators to loads. Reliability is their focal point. Sure, Massachusetts has policies that caused a huge in-state coal plant and nuclear plant to close down. They have policies that penalize all fossil fueled plants for CO2 emissions. But, so doesn't Maine and New Hampshire and Vermont and Connecticut and Rhode Island. Maine's politics have as much to do with the loss of reliable electric generation as the other states. We have lowered the generation from the six in-state natural gas-fired and oil-fired plants by two thirds since the Emergency Wind Act was enacted in Maine. The six State Governors recently met to " reaffirm our commitment to cross-border collaboration and advancement of our common goals while working to ensure that the region’s energy system fosters continued reliability and more affordable electricity for local homes and businesses." 384 wind plants helped reduce our CO2 emissions, but also,made the system less reliable. My guess is, If we are not interested in participating to foster a reliable network , we may find such hostile policies will bring about our exit from the regional network. Always disliked the term NIMBY and what it stood for. But now I am NIMBY!!!!! NO TO CMP!!!!!!!!! What is interesting, is that those who were for, say, the war in Vietnam, were the same ones willing to fight by whatever means available; including, but not limited to, the use of DDT. Which is why that product was also widely used here at home. By the way, what is a 'real Mainer'? Sounds like the same mentality of 'if you are not for us, you are against us'. Incredible how older populations, no matter their own bias of modern indulgence, have not even learned from their own pasts. That faction of 'NIMBY's, would of course be visiting each other by use of automobile, navigated by cell phones, and surely while utilizing all sorts of products marketed by companies that promise them of minimal impacts on the environment. The people of Maine are living proof of what is outlined in '1984'. Tom Saviello recently posted an opinion to the SunJournal. It’s quite informative really and addresses your horse and buggy theory in a round about way. You see, what l learned from that article was that some of those electric cars that we’ll have, if we can afforded them, can and will lose efficiency as the temperature gets colder up north here. Some of those batteries drop 40 percent when the temperature hits 20 degrees. So in essence, its not the NIMBY’s who may be saddling up. Give the article a read. Clayton hit the proverbial 'nail on the head'. Maine set itself up for this debacle, by not setting up a more reliable energy generation plan here at home. Don't want to interfere with that pretty coastline though, and that comes back to bite ya. I actually side with you, and am going to call it what it is, as well. Think I do not love the landscape around here? It is why I am a taxpayer myself. I have been around since before several wind farm projects popped up on the horizon, and it is a sad state of affairs to see these things come about. However, I also see the increasing trash on the roadways, the lack of recycling, even something as simple as composting, and much of it attributed to what others wish to dub 'real Mainers'. Yea, this 5 day event at UMF ought to be real interesting..
Rationale- when I go to a committee hearing on the subject at the state legislature and I see 9 lawyers or businessmen in suits who are paid to be there versus 40 people who took parts of a day off to testify for the state they love- those are real Mainers. When I go to a town meeting where 200 people are speaking from the heart versus a paid spokesperson from CMP- those are real Mainers. When I organize a meeting in a local pub and people join us and thank us for what we are doing- those are real Mainers. When I see guides and sports and landowners and small businesses all along the corridor unite for a common cause- those are real Mainers. Terry, thank you for the information. I always forget that not everybody understands my sarcasm. My opinion is if people don't want this in their back yard then they should say NO. I don't, but I am just one and it would be unfair for me to impose my beliefs on the majority. I am pretty educated on the battery/solar/automotive industry. I also have seen things progress over my lifetime from what one year is " state of the art " to the next year being " horse and buggy " thinking. When people come on threads like this and start spouting off that heat pumps are 300~400 times more efficient than any other heat and if we don't go along with this project we will be driving horse and buggies it is a red flag for me. Yes, we need to stay up to date with technology but we also need to be prudent. If power costs Mainers more rather than scaring the landscape we get to just charge more to people who use the beauty. It all kind of works out. But that is just me. It will get run through, life will go on, my property taxes will never decrease, nor my electric bill. Rich people will get richer and the poor will have less. It's the way it has always been. I know better than to believe politicians or big business who tell me otherwise. Oh, I sure do not need to read an article about the lack of efficiency in Electric Vehicles when they are in certain climates. I do not own one, for reason beyond just affordability. Though that does, indeed, support the fact that renewable this and that, is as I stated, an outmoded idea. It does not quell America's, nor Maine's, energy dependancy. As Clayton so eloquently pointed out, Maine has its own unique set of hurdles. I do, however, recall Saviello passionately pushing for expanded pit mining in this State.. Some diversity of industry interests, he has. Just remember, we we're told how great the lottery would be for our state, schools and infrastructure. Hit any potholes lately? Have you seen any decrease in school budgets? The people of Maine will gain nothing from the CMP corridor except an unsightly array of poles and wires. Oh and don't forget the wind turbines, beautiful just beautiful. Governor Mills dont be an Angus King. I value the natural beauty and slow life style we enjoy here in most of Maine. A price that I am more than willing to pay. You're thinking taxes.... But wait there's more..
Taxes skyrocket as a result of people demanding the great and furious things in life,,, all while living in this beautiful place. Well we can't have it both ways. I don't want to be a slave to higher taxes either.. So I'm willing to slow the hell down,, because the roads don't get resurfaced every time there's a little bump.. I don't need everything all shiny and new,,, like it is else where. The problem is the SPENDING.. FOR LAVISH SERVICES. IF YOU DON'T LIKE SLOWER, FRUGAL, ROUGHER,,, GO AWAY AND HAVE ALL THAT. Its funny, Gov Lepage tried for years to get Maine to change its laws so we could benefit directly from clean and green hydro power from Quebec. Now people who didn't support that are complaining that we are not going to benefit from this short extension of an existing power line. I honestly think people just want to complain. The majority of those posting have probably never even seen the harvested woodlands that would be cut again to build the last section connecting to hydro Quebec's lines. Its not pristine, virgin forest. Its a working forest. Deer and wildlife thrive on the browse provided by these areas. The sky is not falling, a necessary part of our increasing demand for electricity is being built. Wind and solar are neither constant nor reliable. And they are most definitely not affordable. Until we come up with a new option, hydro is our best bet. Unfortunately the anti Lepage crowd stopped us from directly benefitting and now we have to indirectly benefit. But we will benefit for a much lower cost than wind or solar. Lower cost environmentally and financially. Nimby club member. No need to yell, I agree with you, we are on the same page. Please excuse the sarcasm I write, I will try to be clearer in the future. It may well not be a done deal, but mark my word, it WILL be decided in the court of law. CMP has way too much invested to just walk away from this project. They have very deep pockets to fight this. Whose Mainer pockets will be used to fight them? BillyJoeBob, I admire your last comment. No, nothing will ever become more affordable, and you and me just found common ground. @Rick, let us not forget that Angus has not been the only liar/profiteer; in fact, far from so. Baldacci sits on Avangrids Board, and every single politician is beholden to some private donor(s). I focus on Saviello, as I do, for the same reason. Maine is up for sale, like everywhere else, but with paid (and who are also taxpayer supported) representatives at the helm. Divide and conquer is what stands to make or break the rest of us, though we never talk about the entitlements of those otherwise would be representatives/public servants; do we? Dare we not forget what Citizen's United did to undermine every one of your votes. So, best of luck, folks. Oh, and to 'Nimby Club Member' (I genuinely laughed): Let us not forget that Services are also rather necessary for those who need improvements to accommodate, say, those less fortunate than the general populace. However, I drive slower too, could care less about internet (other than conversing with you fine folk), and I enjoy that pace of life for which Maine should be most known for. That which initially brought me here, myself. Sadly, business would rather move at break-neck speed, and unless Maine wants to secede from the rest, people had better start looking at others, from all walks of life, differently than they do around here. Saviello's Op-ed in the Sun Journal, dares to mention "folks from afar", which is a rather derogatory and segregative statement. Furthermore, Darryl, I agree, though there is a fine line between inclusion and division; of which I hope that these real Mainers are not blinded by partisan political ideologies. One does not have to run around the State, using resources more than others (and of which they may not have, relative to others), in order to be an upstanding citizen, or positive influence to their peers all over. These matters are about values, which know no borders. I hope you agree too. NECEC is a BAD DEAL for MAINERS! Come on Farmington - Vote NO! I think it is time for a reset. This project will have very long lasting implications for the future of Maine. It is time for everyone to take deep breaths, step back, and look at benefits and costs calmly and rationally. Just maybe then we could get it right. Apparently our Franklin County Commissioners just withdrew their support from the CMP’s Corridor. The NECEC plan, as stated by NRCM, is not integrated into an encompassing and coherent energy policy aimed at greatly reducing carbon emissions; I find that to be its major shortcoming. There are no free energy lunches. I would trade ridgeline turbines, solar fields, environmentally sound designed hydro and their associated transmission corridors for the impacts of doing nothing to combat climate change. The comparisons of harm done between those impacts and failing to limit emissions are vastly different; I can live with a power line, I don't wish to, or perhaps can't, live with food production disruptions, mass migrations, climate induced wars, and severely degraded forests and oceans. When we NIMBY projects that have some potential for curtailing climate change, we are saying YES to fracking in someone's backyard, and fracking is not the solution to climate change. We should not export our problems to others. We should pursue smart and multiple solutions here at home. The nearest thing to a free clean energy lunch is residential rooftop solar. It uses already developed spaces, coexists with the existing grid and offers the ability to develop intelligent microgrid technology. It can also charge an EV in your garage. While auto manufacturers are willing to sell us every SUV and pickup they can, they are also investing billions in the next generation of EV's. Some of those will have AWD and the ground clearance to deal with Franklin County frost heaves. They already have the range, winter and summer, to satisfy a large percentage of user's needs. It would be smart to adopt EV's when and where they are suitable for individual consumer's needs. It is karma that CMP--with much help from the always backward LePage and the idiots who enabled him in the legislature--attacked home solar energy and thereby earned the disgust and distrust of the very people it now needs support from. I'm sorry...What does ISO-NE have to do with this? It is a request from Mass for energy that off sets assets being retired and is not being replaced/built in their back yard. Absolutely, and rooftop solar has been an option for longer than many of the wind farms in this state have existed. Mainers, and the Country at large, need to hold these 'representatives' accountable for their betrayals. Rooftop solar is an option for people who can afford it. Those of us who care about return on investment know it is not a cost effective option. Solar and wind only work when subsidized by the taxpayers. In Europe they use them because they pay 4 times as much as we do for electricity. Here, Hydro is the only green option that is both reliable( water flows downhill 24-7-365) and affordable. As for curtailing climate change? Come on people use common sense, and listen to the scientists. We cant control the weather. We cant reverse a natural cycle of the earth. Yes we may have sped it up, but no scientist shows any evidence that we can stop or reverse it. The fact is, the earth has been much warmer than it is now. Why bankrupt future generations fighting nature. We wont win. As for the short extension of an existing powerline? Im thinking people just need something to complain about. Its honestly not that big a deal. I am also a passionate member of the NIMBY club. The CMP swath that neighbors my property is about to be widened by 70 feet. Depending on which side they widen, this could be within 25 feet of my house. Then 95 foot high steel 'monopoles' will be erected on that widened swath, literally In My Back Yard. When i chose my house site over 30 years ago it was done in consideration of the existing powerline buffer. My property value will now spiral downward FAST! Does Anybody think my taxes will spiral downward commensurately? depending on where you live zaphod the widening is on the north side or west side of the power lines. Here in Farmington the lines that parallel Bailey hill rd. the new poles will be set on the side closer to the road and to our home too. See you on the 25th at the town meeting and vote NO. Finally a great discussion and some rational comments here in the thread that help me figure out what my part is to stop this. Looks like the only hope is to converge April 1 through April 5 at the University of Maine at Farmington campus. Too bad that most of us work for a living and arn't getting paid to present during normal work week hours. I can only make it to the events Tuesday and Thursday that start after 6pm since most of this "public" discussion is being presented from 8am -4;30 pm when we are.... at work. Please go if you can and double your voice for me. Thank you. I'll do what I can. Mort and Zaphod I feel your pain. Actually Dec 2018, and Jan and Feb 2019 were the best solar power Dec, Jan & Feb I've had in the past seven years. March is looking to be good also. Oct and Nov 2018 were not good. A lot depends on the angle the panels are mounted at, or if they can be tilted to the optimal angle for the season. Once the sun comes out they shed snow and ice very quickly if at the best winter angle. In any case, the panels don't lie, it has been remarkably sunny for the past three-plus months despite the 3' of snow layered with icy crud on the north side of my roof. Zaphod, despite any other disagreements, you have me on that one. I have extended family of whom has had to swallow eminent domain; it's rough, I know. To the others, rooftop solar would be wide spread reality, if this country stopped subsidizing the wrong things. Eddie, I have to disagree with you on this one to some degree. I believe that you are correct regarding the solar and wind comment and for your comment on how we might affect climate change. We won't win fighting nature, right again....... BUT - a short extension? And for what? You have to understand that this green washing of Hydro-Quebec and sticking with the governor's climate change platform is a smoke screen. Mainers will get a benefit of around 40 cents a month on their bill. CMP gets $5 million/month and HQ gets around $40 million. Fair trade? There has been NO independent assessment of the potential damage to the ecosystem - cutting around 35,000 cords of wood does have an impact and using the fuel needed to harvest and transport all of that wood seems a bit foolish. The real story here is that SOMETHING is not right. No independent assessment of the REAL costs; people backing this project without FACTS; cmp funded ngo involved where Peter Mills is part of the mix; and not a word from agencies like ACF and Maine F&W Service. Strip away everything else and this project smells rotten. And THAT is the point. Rooftop solar is expensive. How long before you guys advocating this get your money back ? I personally don’t think our tax dollars should be subsidizing any of these options. If it can’t pay for itself reasonably through usage why put tax dollars into it. We waste enough tax dollars we don’t need to spend it on solar,wind,health insurance or anything else. If you want to put tax dollars into something how about our roads and bridges. One last question with all these electric charging stations possibly going in, where will we plug in the trucks to plow all the snow out of your George Jetson fantasies? Eddie I agree with kost of what you said up until it’s not a big deal. It is a big deal. We should have kept the hydro we already had in this state. Look at how much Maine could make if it were from the damns we already had. On rooftop solar. There are a few things besides just laying a couple of solar panels and hooking up a couple wires to consider besides what some have already expressed. The fewer holes in a roof, the better. Not all roofs are at the correct angle or direction.Not all locations have enough sun exposure. If a panel is not at the proper angle the snow will just pile on it. The amount of electricity produced from rooftop solar will only help some in the total consumption of most modern homes. They need to be tied into the grid for the house to function. Of course there are lots of glossy pamphlets that will tell you just a couple panels will take care of all your needs. All meaning that not every house, or household, would benefit with rooftop. Especially if you factor cost/usage. Also if there is a failure you must pay for the repairs. Agreed, a great discussion here. I also agree that rooftop solar will not be a cure-all; but what ever is.. I think I side most with the logic, say, of utilizing the median space of a highway makes most sense. However, something I do sense, is that many may be willing to sign off on this project, if it was not nearly as one-sided of a deal. I see an awful lot of concern, and focus, on what the company recoupes over that of the consumers.. I pay more in local, state and federal taxes every year than the amount of the one-time rebate I received for my solar system. Who are these people who think they know how best to use my tax dollars? Okay, I say that tongue-in-cheek but think about it. I get so tired of clueless people saying rooftop solar doesn't work, is a poor investment, etc. CMP would not have gone after rooftop solar if it didn't work and wasn't a good value--they are afraid of losing customer revenue--that is how well it works. My CMP bill over the past 16 months averaged $26.77. My total home power use averaged 524 kWh per month over that same period. Do the math. I also replaced an inefficient use of propane with electric which shortened my payback time considerably. 80% of the electricity I use is produced by sunshine. When free fuel falls on our roof, an intelligent species is supposed to be able to figure a way to use it. Yes, solar has to be done correctly to get the best performance. No surprise. Ok David Betts can you answer my question? How long will it take to cover your investment into solar ? Mr. Betts, while the fuel that falls on your roof may be free, processing it into energy certainly is not. Some one is paying for that processing. And in order to process that fuel into energy it would make sense to include a profit in the process. If only you could have made a 25% larger system CMP would be paying you, correct? Free money? If solar was so profitable and the return on investment so great common sense would dictate that CMP would have seas and fields of solar farms and need nothing more. You are entering a rather gray area as to who is paying for what ( subsidies, rebates, discounts, initial system cost... ) and without specifics it's difficult to know the true cost by what you posted. As far as an intelligent species using power, using it I don't think has ever been an issue or problem. The issue is who is paying for it and the goal ( I thought ) was to use as little as possible with the same results as used previously with the least amount of negative impact on the environment. Congratulations on your system it seems to be working well for you and by your comment you seem very proud of it. And, what would the true cost be without guaranteed buy back from CMP and other subsidies received by taxpayers and rate payers. I get it that it's an alternative, but it's not cost effective when looking at the whole picture. It's also not viable as a stand alone option unless you drastically change your lifestyle. If it makes you feel good then do it. But be honest. It makes way more financial sense to improve on more reliable options. Solar may one day be that option, but until storage methods improve, it just can't compete with constant sources of power. Nuclear, natural gas and hydro. Subtracting the $26.77 (my average CMP bill) leaves ~$59 each month attributable to solar generation. $59 per month times 12 months = $708 per year's worth of solar power. The system is rated at 4300 watts max. output. At $3 per installed watt 4300 x $3 = $12,900 Divide that by $708 gives a 18.22 year payback period. $3 per watt is a pre-tax credit price. Note that to get a tax credit, you have to owe the taxes, it's not a rebate. In Maine CMP will never send you money for excess generation. Excess kWh's in one month are "banked" for future use. They would be applied to your following monthly bill(s). If banked credits are not used within 12 months, they expire and are worthless to you. @Joe I agree the cheapest and best energy is the energy you never needed due to insulation and overall energy efficient buildings and appliances. But, some extra energy will always be needed and it should come from the cleanest possible sources. The goal of rooftop solar tied to the grid is not to power the world 100%, but taken as a regional whole those solar kilowatt-hours subtract from the amount of other fuels required, less gas, less nuclear, less hydro, etc. Nuclear is very expensive--no one has even completed a USA nuke plant in decades and a couple under construction have been abandoned recently due to cost overruns. Nuke also requires mining and the associated issues with that. We apparently cannot afford a national nuke waste repository--big NIMBY problem there. Gas adds to greenhouse warming, needs pipeline corridors, and the fracking process depends on polluting a lot of fresh water plus the waste fluid injection wells have risks (minor but damaging quakes, potential for ground water pollution). Hydro generally results in degraded riverine systems--in Maine that means starving ocean fisheries for food stock. Hydro done environmentally well is expensive to build and maintain. Hydro in Quebec has flooded vast areas of what used to be boreal forest. Those decomposing flooded lands are sources of greenhouse gases that replaced greenhouse gas sinks (live trees). Wrong direction. What does rooftop solar really cost CMP--and by extension--other rate payers? CMP sells any power I push to the grid for the full retail price, roughly $0.16. The 9 cent energy supplier portion of that 16 cents is pure profit at that point to CMP since they never bought it from a generator they don't owe anyone but me, and all they will ever give me is replacement power. The cost to CMP of fulfilling a banked credit is whatever their internal cost of operation is to supply power which is less than the value they credited to me. There is a slight overall margin of gain there for CMP. CMP cannot show you any equipment costs they spent to make grid-tied solar function in their system beyond a second meter, which isn't technically necessary. One smart meter can do it. Same transformers, same wires, same poles. Since locally generated solar will be consumed by the nearest load demand on your street, it doesn't make use of long-distance transmission lines and substations. That means the cost to CMP of handing that solar power is very low in comparison to buying it and transferring it from a distant generator. Note that CMP is not against commercial solar at all, just rooftop because those $59s per month are cutting into their revenue. CMP's Maine monopoly guarantees them a PROFIT, not REVENUE. If the MPUC regulated CMP on the basis of revenue, then we would all have a higher fixed monthly minimum bill that represents the cost of transmission. Seasonal homes and camps are also lower than average consumers of power on an annual basis and they aren't pushing high profit kilowatts to the grid either. It costs CMP just as much and possibly more to maintain the wires and poles running to those buildings but they didn't become a target like rooftop solar did. Take an anti-green governor who packed the MPUC with ideologues, stir in a few lies and wild numbers from CMP's CEO and you see what happened and why Mills and the legislature are fixing it now. Mr. Betts, thank you for the numbers. My wife and I live in a 1000sq' house. We have propane dryer ( air hung first ) and propane gas range with Rinnai back up heater ( used minimally ). The house is moderately insulated. We have a heat pump for one room and whole house cooling. Are primary heat source is wood. We consume almost exactly the same amount of electricity as you. I would be curious to know how you heat, what size house you heat, appliances and consumers of electricity. Not everyone can afford or is in a situation to build a super efficient home and all the supercents appliances. So I think that would have to factor into the cost. But I do appreciate the numbers you offered and I am a proponent of solar. Have installed many units. But there are also a lot of other factors to consider when retrofitting a system. One of the biggest problems I see is a lot of people are just wasteful. It's good to see that you are not only utilizing the resources you have but conserving as well. Exactly, Its a good idea if your willing to spend the money. After 20 years if nothing breaks and no maintenance is needed there is the possibility of a return on investment. For some that works, for most it doesn't. The thing is, your still dependent on a constant source of power. Still hooked to the grid, because even if you can generate enough power, theres no way to store the amounts necessary to cover usage when theres no sun. We haven't reached a point where we can stop upgrading the conventional systems we all, even those with the money for rooftop solar, rely on. Nuclear technology has come a long way, we could safely and cleanly power the entire country if regulations allowed. Unfortunately old stigmas and false perceptions of it are hard to overcome. Of course I can't predict how long or exactly how well my solar system will function without repairs. For the past seven years it has worked flawlessly and as advertised. I have reasonable confidence that it will more than pay for itself but I don't see it as a get rich scheme by any means. Other than recording monthly output I pay it no more attention than my refrigerator. It's just another home appliance. Expanding community solar (I think the current limit of community members is 10 along with a cap on system size) to 50 or 100 or whatever number makes financial and energy sense will open the door to solar for people who cannot have their own independent system. Renters, people whose homes aren't sited for solar orientation, people who can afford something they are comfortable with but less than an entire system. We could have had this 2-3 years ago without LePage interfering. It is worth noting that grid-tied solar power was never intended to be a sole source for a home. That really isn't a valid criticism; it's like saying your car can't fly. There are hybrid grid-tied/islanding systems on the market now. Those will function stand-alone and can be designed (and priced of course) for a little power or enough to get a home through 2-3 days of no grid power. I hope you can reframe your thoughts about what grid-tied rooftop solar can accomplish instead of faulting it for not doing what was never intended. Every gigawatt of solar energy (free, clean fuel from the sky) that we can intelligently use is one less gigawatt of conventional power plant capacity that we have to build, fuel and maintain. That is an engineering challenge that makes a lot of sense to solve, and it is being solved step by step. A little "can do" attitude would be in the American tradition. The problems should technological, not false political barriers put in place by those with vested interests in dirty fuels or those trying to preserve a dying revenue stream like CMP. There are plenty of ways CMP could step into the future and make money on alternative energy combined with smart grids and micro grids. If CMP needs the legislature to reduce the barriers between generation and distribution businesses in ways that benefit, they have lobbyists and their parent company Avangrid, is already involved in alternative energy projects here and there. Massachusetts should just go rooftop solar then no need for the corridor expansion. Thank you for the breakdown David Betts. I will keep my money where it’s at I guess. As for Governor Mills fixing this I believe you will be surprised to find she doesn’t care as much as people think. She’s already put a big dent in the “rainyday” fund. With no signs of slowing down.